A leading supplier of heavy building materials to the construction industry, Hanson UK has a firm commitment to sustainability and has a long-term strategy based around the themes of people, water and biodiversity, carbon, systems, and waste and raw materials. 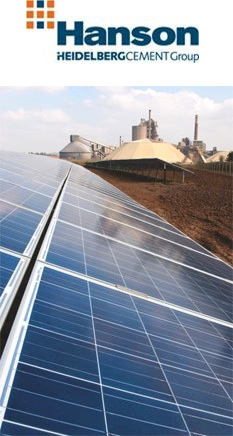 The company has produced an annual sustainability report for several years. It asked Lucideon (then known as CICS) to independently verify its 2013 Performance and Sustainability Report, and supporting data, in order to add robustness to the reports and enhance its credibility for stakeholders. Following a strategic analysis to reduce risk and to guide the detailed planning of the assurance process, Lucideon’s verifiers made a number of site visits to both operational sites and to Hanson’s head office. The scope of the verification included energy use, carbon emissions, waste, water consumption, transport impacts, recycling, biodiversity, health and safety and community liaison. The verification was carried out using the principles of the Global Reporting Initiative (GRI). In addition to executing an audit trail of data, the verifiers also reviewed and audited data collection systems. Also key to assessing the relevance, effectiveness and efficiency of Hanson’s internal measurement, reporting and disclosure systems was the interviewing of staff about the data gathering process and the auditing of existing management systems. Finally, the sustainability report was reviewed for any major anomalies within the report and between the report and source data/information. Many companies and organizations now measure and monitor environmental parameters as part of their overall sustainability and corporate social responsibility policy and, consequently, produce a sustainability report. Hanson UK, by having their sustainability report externally verified by an independent body, has added credibility to their statements, policies and data. This provides confidence to shareholders, investors and the public, and backs up Hanson UK’s commitment to sustainability. Engaging Lucideon to supply third party verification adds further weight; the independent sustainability assurance provider is a prominent environmental and energy management system assessor and the leading GreenHouse Gas (GHG) verifier in the UK and Ireland. Lucideon works to the latest international reporting standards for environmental and sustainability reporting and is also accredited by UKAS (United Kingdom Accreditation Service).